I just submitted my recipe for the Zuuzs Grand Spring Recipe Challenge. This dish is one of my most favorite meals - fairly quick & easy, very healthy and super delicious (in my biased opinion, of course)! Sprinkle the chicken pieces with 1/2 tsp. salt, 1/4 tsp. freshly ground black pepper and 1/2 tsp. paprika. Heat 2 tsp. 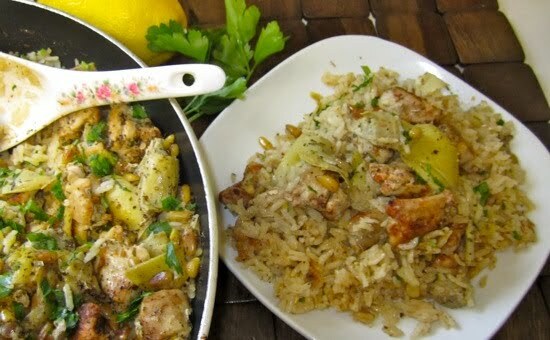 olive oil in a nonstick skillet over medium-high heat - add chicken to the skillet when pan/oil is hot and cook for 3 minutes on each side. Remove from skillet and set aside. Add pine nuts to skillet and gently toast (stirring constantly) over medium heat for 2-3 minutes or until the nuts begin to take on a golden brown color. 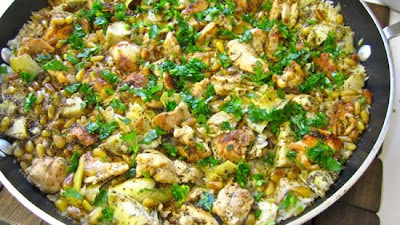 Add 2 teaspoons olive oil, uncooked rice, artichoke hearts, Italian (or Greek) seasoning, salt, pepper, lemon peel and juice of 1/2 of the lemon and the chicken broth. Add the chicken along with its juices and gently nestle the chicken in to the rice mixture. Bring to a boil, reduce the heat to low and cover tightly. Simmer for 20-25 minutes or until rice is cooked. Sprinkle with the remaining half of the lemon and parsley. *NOTE: If using regular (table) salt you will need to reduce the amount of salt by 1/4 teaspoon. Do you have a favorite recipe you would like to submit? Enter the Zuuzs Grand Spring Recipe Challenge HERE! Looks yummy and the ingredients look good too... a healthy meal i would say too.